Everyone has dreams about activities they want to share with their families at Walt Disney World. I’m no exception. There are plenty of places I want to stay with my wife, tours I can’t wait to take her on and meals we need to share, but some of the greatest moments of anticipation are withheld for the times I get to spend with my father at Walt Disney World. 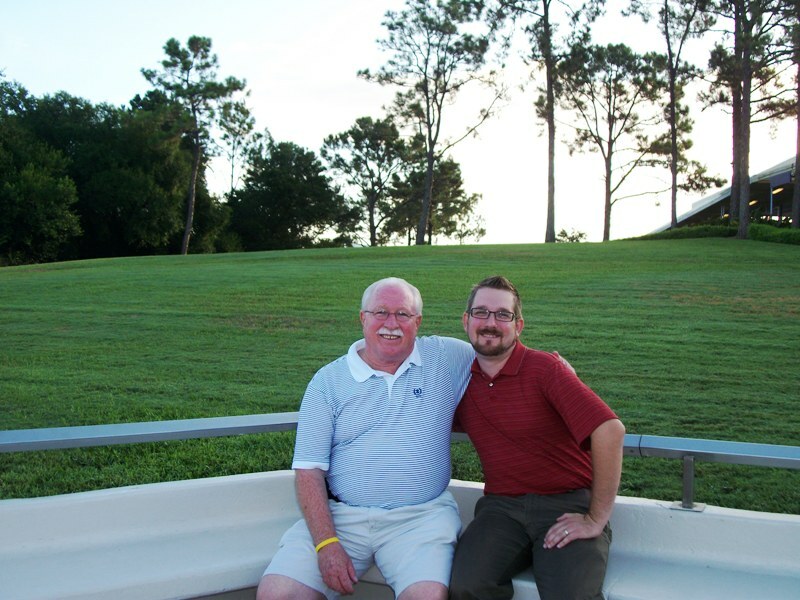 The stories of my dad at Walt Disney World, or stories of how he convinced us to spend more time at the Vacation Kingdom, would give you the perfect image of a child at heart. While he may appear as gruff, the more he speaks about Walt Disney World or the more time he spends around the parks and resorts, the more the man I remember from my childhood appears. In just a little under two weeks, my dad and I are taking our first father-son trip since I’ve been married. One tap are a bunch of great meals and activities, including a couple of rounds of golf. My father introduced me to golf in my late teens, and while I only play once or twice a year, the times when I get to play with my dad are some of my favorites. It will be the first time either of us will have a chance to play at Walt Disney World, and we’ll be playing on the original 1971 courses. I fully expect to have some of the worst rounds of my life, but I’m going to enjoy every minute. Sure, I have a lot of data collecting and research to do for the Gazette while I am there, but it will be the moments I share with my dad that I’ll cherish most. When I was a child he passed along information about why things were in the parks, show me the best place for a nap (as a child it was the arcade behind the France pavilion) and showed me the best ways to navigate through the parks. My aunt used to say I was the best tour guide who didn’t work for Disney and my father was the reason I could do all of those things. This trip, I’ll get to show him details and the best way through parks he’s not as familiar with. We all have are guiding forces into why we love Walt Disney World and why we know what we do, and we all have moments we hold dear and moments we can’t wait to create. While the moments I spend with my wife are the ones I know will flourish as we grow a family together, it is creating new memories with my father, the man who showed me the Disney way, that I am most looking forward to in the coming weeks (Oh, and I hope to spend some time with some of you along the way, and you’ll get to meet the man who set my path in motion, who you have to thank for the Main Street Gazette.). What are some of the can’t wait to create memories you have? Awesome! I do a lot of trips with my mom. Matter of fact, just got home yesterday from an extended weekend with her, one of my sisters and a niece. Did photo shoot as a special surprise for her. Enjoy!!! You are going to have an amazing trip! All our trips are family centered and my parents took my brother and I to WDW when we were little. Now they come along with us as the grandparents. Our first trip there were just four of us and this next trip there will be 11 of us! Such a great family vacation. Enjoy! I'm terribly behind in my blog reading, but this one sold me. I've enjoyed Main Street Gazette ever since I first discovered it a couple of years ago, but this post gives me a new and different outlook to the words I now read here. What a terrific perspective to this trip with your dad! Also, I love those old WDW photos. Takes me back!